Note: Read verses 1-10 in order to get the context in mind. Harvesting was a far more difficult task before Cyrus McCormick invented the mechanical reaper. Even laboring long hours, farmhands using sickles could harvest no more than one acre per person per day. And with this we have introduced the theme of today's passage, that of sowing and reaping. But before Paul lays out the principle of sowing and reaping, he first speaks of the importance of sharing in all good things with those who teach. NKJ Galatians 6:6 Let him who is taught the word share [Present Active Imperative > κοινωνέω, koinōnéō] in all good [ἀγαθός, agathós] things with him who teaches. This verse serves a dual purpose and provides a transition from one theme to another. 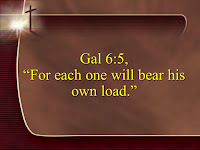 It provides an example of bearing one another's burdens, which was the dominant theme of verses 1-5, but it also provides an example of sowing to the Spirit, a theme which Paul takes up in verse 7. The focus here is clearly on the relationship of the members of the body with those who teach them the Word of God. Paul uses the present tense of the verb koinōnéō when he commands one who is taught to "share in all good things" with the one who teaches him. In this way he stresses the ongoing duty of those who are taught to those who teach them. NKJ Luke 10:7 And remain in the same house, eating and drinking such things as they give, for the laborer is worthy of his wages. Do not go from house to house. NKJ 1 Corinthians 9:11-14 If we have sown spiritual things for you, is it a great thing if we reap your material things? 12 If others are partakers of this right over you, are we not even more? Nevertheless we have not used this right, but endure all things lest we hinder the gospel of Christ. 13 Do you not know that those who minister the holy things eat of the things of the temple, and those who serve at the altar partake of the offerings of the altar? 14 Even so the Lord has commanded that those who preach the gospel should live from the gospel. NKJ 1 Timothy 5:17-18 Let the elders who rule well be counted worthy of double honor, especially those who labor in the word and doctrine. 18 For the Scripture says, “You shall not muzzle an ox while it treads out the grain” [Deut. 25:4], and, “The laborer is worthy of his wages” [Luke 10:7]. Again, I think Paul's meaning here in Galatians 6:6 would include such financial remuneration, but I do not see how we can restrict his meaning either to financial support or to the office of pastor-teacher, even if we might rightly assume that he has these matters primarily in mind. So, for example, to share in all good things with the one who teaches may well include telling your teachers about what God is doing in your life as a result of their teaching, or perhaps giving them a card to show your appreciation for their hard work, or defending them when they teach the truth even if others attack them. Perhaps an example from my own life might help. I recall when I first came across this verse as a young believer. I remembered as I thought about it that there had been those in my past who had taught me the truth of the Gospel, despite my consistently having rejected what they said. As many of you know, I grew up believing in works salvation, but despite my heretical views, God had placed godly teachers in my life. Later, after having believed the truth of the Gospel, and as I thought about this verse, I was convicted that I should contact those who had consistently and lovingly taught me the truth. So, for example, I found the address of an older lady named Rose Bailey, who had pulled me aside one Sunday morning as a child and explained to me that we cannot earn God's love and that we don't have to, because He saves us by His grace on account of what Jesus did for us when He died on the cross. I wrote her a rather lengthy letter explaining about how God had saved me and how she had played a role in it. I was then pleasantly surprised to find out that she was still alive, when she wrote me back, telling me how she had prayed for me and how excited she was about what God had done in my life. She also let me know how she had shared my letter with everyone in her small church and that it had been a great encouragement to them as well. 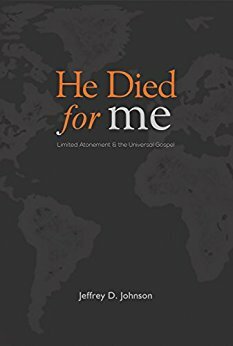 This is one example of how I was able to share in a good thing God had done for me as a result of teaching I had received when I was a twelve or thirteen year old boy. But I can also tell you as a teacher of God's Word that I love to hear about how God is working in your lives as a result of my teaching ministry. It is one of the most encouraging things you could ever do for me, and it helps the burden of the teaching ministry seem much lighter. 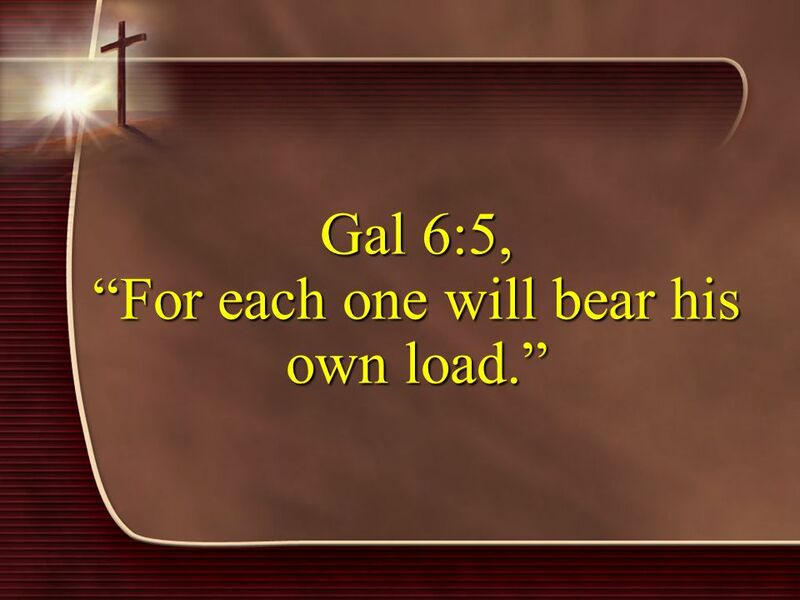 In this way, you can help bear my burden and the burden of others who regularly teach within the congregation (recall vs. 2), but in this way you can also sow to the Spirit, as Paul indicates in the next two verses. 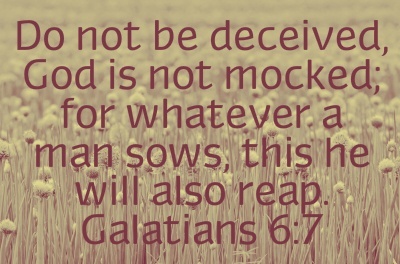 NKJ Galatians 6:7 Do not be deceived, God is not mocked; for whatever a man sows, that he will also reap. 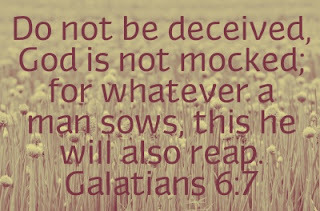 Here Paul warns those who might not want to help support the ministry of the Word that they are simply deceiving themselves and mocking God if they fail to realize that they will reap what they sow. I wonder how many faithful pastor-teachers have been under-appreciated – and under-payed as well – by congregations who are deceived into thinking that their selfishness will not come back to bite them in the end, who may not even realize that they are making a mockery of God and His Word, because in the end it is God Himself and His word that they are under-appreciating and devaluing! Apparently, such a terrible state of affairs was present in the Galatian churches due to the influence of the false teachers among them. You can imagine how discouraged their true teachers were as they began to lose the support of their congregations. But Paul wants them to remember the important principle of reaping and sowing so that they will be convicted of their error and repent. He further describes this principle in verse 8. NKJ Galatians 6:8 For he who sows to his flesh will of the flesh reap corruption, but he who sows to the Spirit will of the Spirit reap everlasting life. I think Ronald Fung was correct when he said, “Paul here seems to regard the whole of a man's earthly life as a period of sowing, with harvest awaiting him on the last day: the eschatological yield is determined by present sowing” (The Epistle to the Galatians, p. 295, as cited by Thomas Constable, Notes on Galatians, e-Sword). This is not to say that we may not reap from our sowing to some extent in this life, but rather that we will not ultimately reap the final reward until the future judgment. However, we should not think that Paul intends to say that we somehow earn everlasting life as a result of what we sow in this life. This would deny everything he has taught in this very epistle about how we are justified by grace through faith alone, apart from works. But remember that, although we are saved by faith alone, the faith that saves is never alone. True saving faith always produces good works in the life of the true believer. True saving faith – faith wrought by the Spirit in our hearts – sows to the Spirit rather than to the flesh. Such faith assures us of our heavenly reward. And such faith never gives up, which leads us to the next verse. NKJ Galatians 6:9 And let us not grow weary while doing good, for in due season [καιρός, kairós], we shall reap if we do not lose heart. As Leon Morris has aptly noted in his treatment of this verse, “It is easy for the servants of God to become discouraged: the opposition they meet is so constant and the good they are trying to do is so hard to accomplish” (Galatians: Paul's Charter of Christian Freedom, p. 183, as cited by Thomas Constable, Notes on Galatians, e-Sword). Sowing to the Spirit means doing good, and it means not growing weary in doing good. But does Paul mean to indicate that we should never get tired as we serve the Lord? I don't think so. I think he is talking about the kind of weariness here that leads to losing heart – or becoming discouraged – to the point that we give up. If we serve the Lord in such a way that we keep our eye on the goal, with a faith that doesn't give up on His purposes and never quits believing that He can and will use our efforts, then we can be assured that we will reap the everlasting life that He has promised (vs. 8). As I see it, Paul is not making our perseverance the basis of our salvation, but he is indicating that our perseverance is connected with our assurance of salvation. And such assurance of God's promise of everlasting life frees us up to serve God at every opportunity, as Paul says that we must do in the following verse. NKJ Galatians 6:10 Therefore, as we have opportunity [καιρός, kairós], let us do good [ἀγαθός, agathós] to all, especially to those who are of the household of faith. Several years ago an article appeared in Time magazine about a doctor who lived through the terrible bombing of Hiroshima. When the blast occurred, Dr. Fumio Shigeto was waiting for a streetcar only a mile away, but he was sheltered by the corner of a concrete building. Within seconds after the explosion, his ears were filled with the screams of victims all around him. Not knowing what had happened, he stood there for a moment bewildered—one doctor wondering how he could ever handle this “mountain” of patients. Then, still somewhat stunned, Dr. Shigeto knelt, opened his black bag, and began treating the person nearest to him. When I look at the staggering needs of a dying world, I can easily become overwhelmed. God certainly doesn’t expect me to frantically try to help everyone in need. That’s too big a burden. Galatians 6 says that we are to “do good to all,” but that doesn’t mean we have to reach everyone. We are to help anyone we can whenever we have the opportunity to do so. Yes, we must do all the good we can for whomever we can. But Paul says this is especially true with regard to our fellow believers, for together with us they are a part of "he household of faith," our spiritual family. This means that, as we set our priorities, our commitment to the welfare of our brothers and sisters in Christ should come first in our thinking. And although we must never let our commitment to the body of Christ cause us to become so inwardly focused that we lose sight of our evangelistic testimony to the world around us, neither should we neglect our primary obligation to the body of Christ in our zeal to reach out to the world. I hope we will all remember that we will reap what we sow, whether it is through our giving financially and materially to others or through providing emotional support and encouragement. And how we sow in this respect is a very good indicator of whether or not we are true believers who can have assurance of God's promise of everlasting life. Note: Begin reading the passage at 5:16 and read through 6:5 in order to get the context in mind. Note also that I have a habit of including references to Greek terms in my notes, whether I actually refer to them or not, so I have left them in with transliterations. As we have seen, earlier in the epistle Paul already commanded us to walk in the Spirit (vs. 16), and then he also spoke of our being led by the Spirit, in which the active role of the Spirit Himself was emphasized (vs. 18). In those statements, as well as this one, Paul used the present tense to denote a continual or habitual walking or being led. In other words, being led by the Spirit, and thus walking in the Spirit, is not something we do once and then we are done. It is something that characterizes the whole life of the believer, day in and day out. But how should this be done? 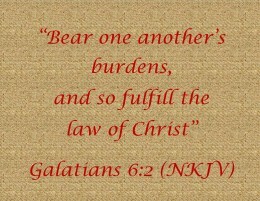 In what way are we to bear one another's burdens? We will see that we do this by restoring others and by loving others. Both of these ideas are taught by Paul in these verses. He begins by giving a specific application (restoring others) and then goes on to focus on the general principle behind it (loving others). We will follow this same order, then, in our examination of the text. And we will see that 1) we must bear one another's burdens by restoring others, and 2) we must bear one another's burdens by loving others. NKJ Galatians 6:1 Brethren, if a man is overtaken [προλαμβάνω, prolambánō] in any trespass [παράπτωμα, paráptōma], you who are spiritual [πνευματικός, pneumatikós] restore [Present Imperative > καταρτίζω, katartízō] such a one in a spirit of gentleness, considering yourself lest you also be tempted. Or as David Guzik puts it, “The overtaken ones need to be restored. They are not to be ignored. They are not to be excused. They are not to be destroyed. The goal is always restoration” (Commentary on Galatians, e-Sword). Restoration is indeed the focus Paul wants us to have. But he not only commands us to restore one another; he also provides crucial information that we need in order to fulfill this responsibility. He says something about who should be restored, who should do the restoring, and how the restoration should be done. Let's briefly consider each of these points as we seek to understand Paul's teaching here. 1. Paul tells us who should be restored (vs. 1a). He says that one “overtaken in any trespass” should be restored. The Greek verb translated overtaken (προλαμβάνω, prolambánō) here means “to overtake by surprise, to overpower before one can escape” (Linguistic Key, p. 518). The use of this verb probably indicates that the person is not deliberately or remorselessly sinning, but, even if he is deliberately sinning, the idea is that he has been caught or trapped in the sin. I don't think, then, that Paul intends for us to be constantly confronting every possible sin we can find in a brother. Indeed, if that were the case, I don’t think we would have time for anything else! Rather he wants us to confront any trespass by which one has been overtaken. And this certainly means that no nagging or persistent sin should be let go without seeking to correct and restore the person caught in it. 2. Paul tells us who should do the restoring (vs. 1b). NKJ Galatians 2:20-21 I have been crucified with Christ; it is no longer I who live, but Christ lives in me; and the life which I now live in the flesh I live by faith in the Son of God, who loved me and gave Himself for me. 21 I do not set aside the grace of God; for if righteousness comes through the law, then Christ died in vain. NKJ Galatians 3:2-3 This only I want to learn from you: Did you receive the Spirit by the works of the law, or by the hearing of faith? 3 Are you so foolish? Having begun in the Spirit, are you now being made perfect by the flesh? NKJ Galatians 5:16-17 I say then: Walk in the Spirit, and you shall not fulfill the lust of the flesh. 17 For the flesh lusts against the Spirit, and the Spirit against the flesh; and these are contrary to one another, so that you do not do the things that you wish. 4) The spiritual are those who are demonstrating the fruit of the Spirit. NKJ Galatians 5:22-23 But the fruit of the Spirit is love, joy, peace, longsuffering, kindness, goodness, faithfulness, 23 gentleness [πραΰτης], self-control. Against such there is no law. NKJ Galatians 5:25-26 If we live in the Spirit, let us also walk in the Spirit. 26 Let us not become conceited …. NKJ Galatians 6:1d … considering yourself lest you also be tempted. 3. Paul tells us how restoration should be done (vs. 1b-c). He says at least two things about how restoration should be done. First, restoration must be done caringly. I think this is indicated when Paul says that restoration should be done in a spirit of gentleness [πραΰτης, praǘtēs]. NKJ Matthew 11:28-29 Come to Me, all you who labor and are heavy laden, and I will give you rest. 29 Take My yoke upon you and learn from Me, for I am gentle [πραΰς, praǘs, adjective related to the noun πραΰτης, praǘtēs] and lowly in heart, and you will find rest for your souls. Here we see Jesus as the ultimate example of “strength that accommodates to another's weakness,” for here we have One who is God Himself accommodating Himself to our weakness! And we are to follow His example when we seek to restore a fallen brother or sister in Christ. We too are to be gentle and lowly of heart as we confront their sin and encourage them to repent. When Paul refers here to “a spirit” of gentleness, he may simply mean that we should have a gentle attitude or demeanor. But it is also possible that he means that we should restore a fallen brother by the Spirit who produces gentleness. Either way, in the context gentleness is definitely the attitude or demeanor we must have, and gentleness is definitely also that which comes from the Holy Spirit. The Linguistic Key to the Greek New Testament says concerning the verb translated considering here that “the verb indicates being sharply attentive, very diligent and the pres. tense indicates continually doing so” (p. 518). In other words, we need to be constantly on our guard lest, in our attempt to help another who is caught in sin, we too are tempted to sin. (1) We might be tempted to fall into the same sin as the one we are trying to help. (2) We might be tempted to be harsh or unforgiving. (3) We might be tempted to be prideful and feel superior to them. Pride will certainly get in the way of our effectiveness in bearing one another's burdens by restoring one another, but it will also keep us from loving one another as we should, and this leads to the second main point. NKJ Galatians 6:2b and so fulfill [ἀναπληρόω, anaplēróō] the law of Christ. NKJ John 13:34-35 A new commandment I give to you, that you love one another; as I have loved you, that you also love one another. 35 By this all will know that you are My disciples, if you have love for one another. So, we bear one another's burdens by loving one another, or, better still, we love one another by bearing one another's burdens. Thus, in this passage we have the general moral obligation to love one another, leading to the general principle that we must bear one another's burdens, and this in turn involves the specific application with which we have spent most of our time this morning, namely the restoring of a fallen brother or sister who has been caught in a sin. NKJ 2 Corinthians 1:3-5 Blessed be the God and Father of our Lord Jesus Christ, the Father of mercies and God of all comfort, 4 who comforts us in all our tribulation, that we may be able to comfort those who are in any trouble, with the comfort with which we ourselves are comforted by God. 5 For as the sufferings of Christ abound in us, so our consolation also abounds through Christ. NKJ Romans 12:15 Rejoice with those who rejoice, and weep with those who weep. NKJ James 5:16 Confess your trespasses to one another, and pray for one another, that you may be healed. The effective, fervent prayer of a righteous man avails much.